Hurricane Gustav is advancing inland from the US Gulf coast, bringing with it torrential rain and severe winds. The eye of the storm, which left nearly 90 people dead last week as it crossed the Caribbean, is bearing down on the Louisiana community of Lafayette. The worst of the storm made landfall west of New Orleans, apparently sparing it from the kind of devastation wreaked by Hurricane Katrina three years ago. An estimated two million people have fled inland from the Louisiana coast. Hurricane Gustav is quickly losing strength after making landfall in Louisiana, and has been downgraded to a Category One storm, with winds of 90mph (145km/h). The storm is expected to move into Texas overnight, dumping as much as 20in (50cm) of rain there by Thursday. US President George W Bush is in Austin, Texas, to oversee the government response. He said Gustav was a "serious event" and insisted that the emergency response was "a lot better than during Katrina". Mr Bush praised those who had heeded the warnings to evacuate, saying he understood how hard it was for citizens to "pull up stakes". The exodus from the Louisiana coast is the largest evacuation in state history. Many New Orleans residents have fled, with only 10,000 left from a population of 200,000. Tens of thousands are also reported to have left coastal Mississippi, Alabama and south-eastern Texas. The BBC's Gavin Hewitt in Lafayette says the city is being battered by fierce winds and driving winds, and every now and again there is a rumble, signifying a huge gust. In New Orleans, a sea surge of up to 14ft (4.2m) was feared and water was clearing levees as the outer rim of the storm brought heavy rains and winds. Waves were causing some flooding but the city's pumps were keeping up with the flow, said a spokesman for the army unit responsible for the city's flood defences. A Federal Emergency Management Agency (Fema) briefing heard that although the high water pressing the walls raised the potential for problems, officials were "confident in the resilience" of the levees. The Mayor of New Orleans, Ray Nagin, has urged caution. He said: "We're still seeing storm surge. There's lots of rain, tornado threats... We are nowhere near out of danger yet." The mayor asked people to "resist the temptation to say we're out of the woods", adding that heavy rainfall could still flood the city over the next 24 hours. 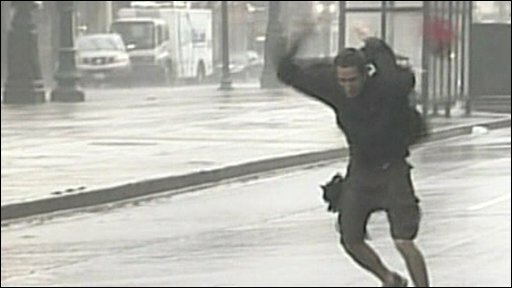 He told CNN that the city would not know until late afternoon if vulnerable areas would "stay dry". Fema officials warned that the damage wrought by Gustav would be "a catastrophe". "We don't expect the loss of life, certainly, that we saw in Katrina," Fema spokesman Harvey Johnson said, "But we are expecting a lot of homes to be damaged, a lot of infrastructure to be flooded, and damaged severely." In 2005, three-quarters of New Orleans was flooded by a storm surge that claimed more than 1,800 lives in coastal areas. The Category Three storm Katrina swept away the city's levees under a wall of mud and water. In New Orleans, a dusk-to-dawn curfew is in force. The Louisiana National Guard has been mobilised and support requested from other states. Crime was a major problem in the New Orleans area in the aftermath of Hurricane Katrina. Concern for those facing the hurricane has prompted the Republican party to scale back its national convention where Senator John McCain is due to accept the party's nomination for president at the event in St Paul, Minnesota later this week. Mr McCain told his party that "this was one of those moments in history where you have to put America first. We will not see the mistakes of Katrina repeated". Out in the Gulf of Mexico, most oil production has been shut down. Three years ago, Hurricanes Katrina and Rita ravaged the region's oil infrastructure and sent oil prices soaring. Meanwhile, Tropical Storm Hanna has strengthened into a hurricane east of the Bahamas in the Atlantic ocean, US officials reported. Hanna is on track to skirt Florida before making landfall on Friday in South Carolina, near its state border with Georgia, US weather experts said. Have you been affected by Gustav? Are you preparing for its arrival? Send us your comments and experiences using the form below.